This letter written by a special assistant of the State Bank Commissioner to C. B. Griffith, Topeka, Kansas, who was probably an attorney for the Utah Placer Company, Denver, Colorado. The letter lists Utah Placer Company's stock certificate numbers, stock holders' names, and the number of shares owned by each person that have been deposited in escrow with the Bank Commissioner to fulfill requirements of the recently passed Kansas Blue Sky law. 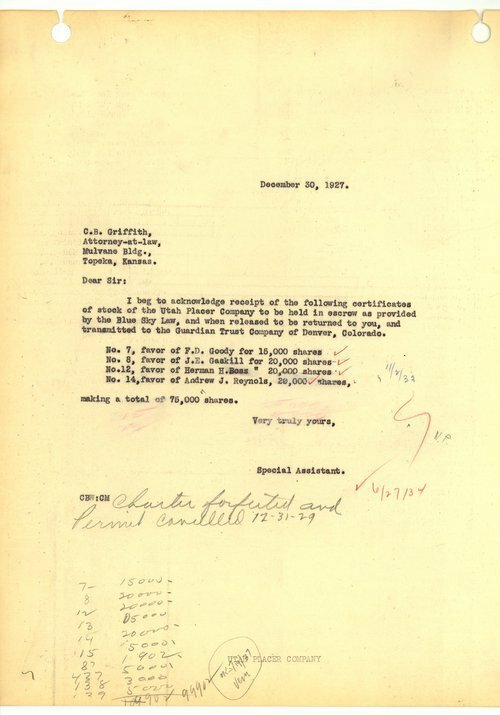 A note on the letter indicates the charter was forfeited and the permit was cancelled on December 31, 1929.